26a. [Actor Michael’s means of support? ], CAINE PILLAR. Painkiller. 28a. [Comic Tina recovered from her wound? ], FEY HEALED. Hayfield. 42a. [Heir of martial artist Bruce? ], LEE SCION. Sea lion. 52a. [Annoyance for actor Colin? ], FIRTH BOTHER. Birth father. 68a. [Thunderstruck critic’s review for actor Richard? ], GERE BOGGLES. Beer goggles. Good one! 88a. [What actor Martin calls his athletic footwear? ], SHEEN CLEATS. Clean sheets. 97a. [Urban legend about rapper Kanye? ], WEST MYTH. Messed with. 114a. [Musician David’s equestrian accouterments? ], BYRNE TACK. Turn back. 117a. [Tart cocktail named for comic Amy? ], POEHLER SOUR. Solar power. Not one of these came to me quickly. I had to work the crossings and start sounding things out, trying to come up with a second word that worked. Favorite clue: 16d. [Partridge family member], PHEASANT? I was thinking of Danny and Laurie and the capital-F Patridge Family. D’oh! Details count. The top and bottom sections are all fairly wide open, but not packed with iffy junk. 1a. [Sissy who’s not a sissy], SPACEK. Oscar-winning actress. Tricky masked capital letter! 24a. [Something given when someone has been taken], EULOGY. Pairs well with 25a. [Tranquil], AT PEACE. I attended a lovely funeral today with touching and funny eulogies, and wasn’t expecting to find the Saturday funeral vibe carried into the Sunday puzzle. 38a. [Positive signs of life in outer space? ], A-OKS. From an astronaut affirming that he or she is all right. 58a. [2007 3x platinum Alicia Keys album], AS I AM. There aren’t a ton of solid three-word answers with only 5 letters. 75a. [Ball club position], SCOUT. Scouting out new talent. I was thinking of golf clubs and golf ball positions and whatnot and wasn’t seeing this answer. 108a. [Cleaning aid since 1889], LYSOL. Sold, via coded language, as birth control! It was, however, both dangerous and ineffective as a contraceptive. 120a. [Philippine province with a repetitive name], ILOILO. I know what you may be thinking: “This is so obscure!” The province has a population of 2.2 million, though, and we’ve certainly seen plenty of crossword answers that are far teenier. TRURO, Mass. (2,000 people). NATICK, Mass. (33,000 people). XENIA, Ohio (26,000). OJAI, Calif. (under 8,000). OTARU, Japan (not among the country’s 110 cities). ENID, Okla. (the state’s 9th largest city, and I’ll bet you’ve never heard of at least three of the bigger cities with longer names). 40d. [German city on the Baltic], KIEL. Population 241,000! Richard Kiel, the over-7′ actor who played Jaws in the James Bond movies, passed away this Wednesday. 96d. [Noted hint giver], HELOISE. When I was a kid, my mom had a couple “Hints From Heloise” paperbacks, chock-full of tips for things like stain removal. I suspect these books are entirely unknown to people under, say, 35. If you’re in that age group, do you know of this Heloise from outside of crosswords? A few dry spots in the grid (STEROL! ), as you see in nearly any 21×21 puzzle, but no unsightly pile-ups of blah fill. Four stars from me. I appreciated having a theme I had to work for. 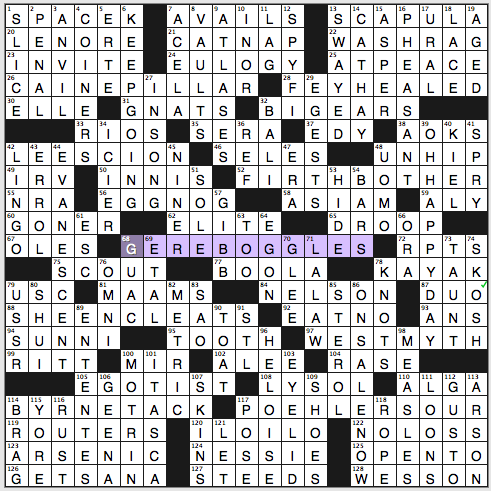 Last week’s Post Puzzler from Frank Longo was a 70/29 freestyle. This week’s Post Puzzler from Trip Payne is also a 70/29 freestyle, though the 29 black squares are arranged differently. Last week I compared the solving experience to completing a sneaky-tough workout. This week I’ll compare it to the regular workout that gets a little tougher at the end when you’re running on fumes. From there, the northwest corner and the southwest corner feel fairly easily. Well, I shouldn’t give the impression I made no mistakes there. I originally had ON A TOOT for [Doing South Beach, perhaps], thinking of the party scene there that gets going very late in the evening. But no, the answer was ON A DIET. But otherwise, I had enough crossings in place to help me suss out the stuff I didn’t know immediately, so it felt like I was making good time. The southeast put up more of a fight. I knew KATIE Holmes as [Suri’s mother], but none of the rest came as easily. I’m ashamed to have forgotten AMANDA as [Spock’s mother], and I mildly kicked myself for not figuring out DIORS as [Some gala gowns] sooner. But eventually it fell too. My Waterloos, if one can have more than a single Waterloo, were the central and northeast sections. And like Napoleon, my downfall was entirely of my own making. For [Unhealthy stuff that’s cured], I had ??BAC??. I couldn’t get past “BACON” as the end of the word. The mental conversation went along the lines of this: Unhealthy? Check. Cured? Sure, why not. So the answer has to end in -BACON. But what two-letter word would come before BACON? B-B-BACON from Porky Pig? So yeah, I didn’t get TOBACCO for the longest time. It would have helped if I knew that BENIN was [Dahomey, today] or if I could remember that TINA was the [“Glee” character] (I haven’t watched that show since the second season, long before Finn’s death). And it would have helped to know that [Obdurate] meant STONY. But as always, these flaws are mine, not that of the puzzle. 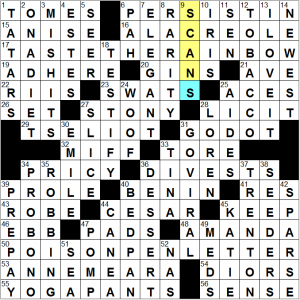 The puzzle had a nice mix of contemporary and classical terms, some interesting vocabulary, some nice wordplay in the clues, and just enough accessible points to make the whole thing solvable. Last week’s workout left me gasping for air. This week’s workout left me feeling energized and ready to tackle my Sunday. The clue for SEEDERS is great. But [Machines that may be in a rut] also seemed to work for FEEDERS, the answer I had in place for far too long. [Bread-devouring?] was a fun, if not especially challenging clue for PRICY. [Where to go in the hospital], an innocent clue for BEDPAN, an entry that, in other hands, might have been clued in a manner befitting a Farrelly Brothers movie. Favorite entry = GO VIRAL, to [Hit it big, in a way]. Favorite clue = [Blondie, for example], which made me think of the comic strip and the ’80s band long before the DESSERT. 23a. [Heroic medal whose recipient didn’t feel worthy of it? ], THE RUED BADGE OF COURAGE. Didn’t realize it was a movie and not just a novel. A FAREWELL is also far better known as the Hemingway book than as a movie. 50a. [Warnings for Rio sailors? ], BUOYS FROM BRAZIL. 71a. [Not a colorful restaurant list? ], MENU IN BLACK. 94a. [Midnight distress call? ], A SHOUT IN THE DARK. 104a. [Clever maneuver by a grade school class? ], KINDERGARTEN COUP. Good one! 24d. [Cabo’s peninsula] is BAJA. Pronounced like BAHA, 76d. [Island band The __ Men]. The Baha Men are from the Bahamas; they’re the “Who Let the Dogs Out?” group. 65d. [Lending inst. ], LIB. Abbrev for “library.” I was thinking of banks, dang it. 59a. [__ historique: opera genre], FAIT. New to me. 35d. [Groundbreaking discoveries? ], FAULTS. My error was here; I thought people might dig their way to discovering VAULTS (Geraldo Rivera! Howard Carter in Egypt!) and didn’t check the crossing clue. Earthquake faults are groundbreaking, sure, but how often are they “discoveries”? I mean, after the first time. Are we finding new faults all the time? Californians probably know this stuff better than Midwesterners. 107d. [A hundred bucks], ONE C. What? No. Who says that? Too contrived. 89d. [Alaskan site of the only WWII battle on U.S. soil], ATTU. Crosswordese island. 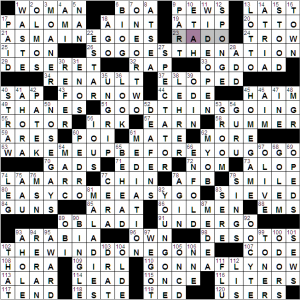 Overall, there’s more 4-letter unfresh stuff than I like to see (ATTU, ITER, OTOE, TYNE, URAL, and so on), plus AEC and ESSENES, but the Sunday LAT is typically clued easy enough that a long-time solver who knows their crosswordese can fly through it without getting mired. A newbie will have a harder time of it. The theme brings a little fun and it’s well-executed. 3.75 stars from me. 23a. [Kinder, gentler Sherman tanks? ], WARM MACHINES. Not war machines. 29a. [Kinder, gentler programming? ], VIOLINS ON TV. Not violence. 34a. [Kinder, gentler Oliver Stone film? ], NATURAL BORN KIDDERS. Not Killers. 50a. [Kinder, gentler order from a sheriff? ], HAND OVER YOUR GUM. Not gun. 65a. [Kinder, gentler James Whitmore vehicle? ], GIVE ‘EM HELP, HARRY. Had a mistake in here because looking at EAR* for 53d. [Fonda in a ’46 Ford film], I guessed EARL. Didn’t know Henry Fonda played an EARP or that John Ford directed a Tombstone film. 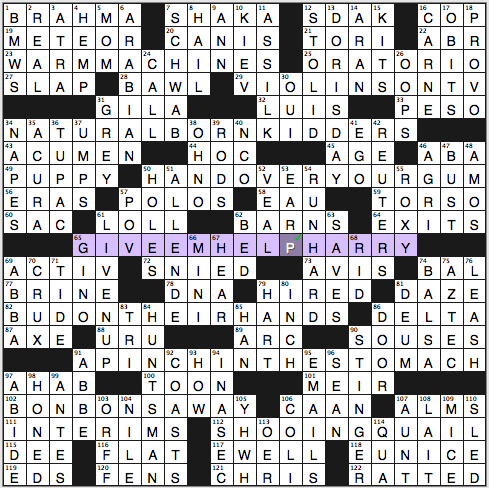 “Give ‘Em Hell, Harry” is the original … but without Googling, EARL seemed plausible enough to me. 82a. [Kinder, gentler fate of barroom brawlers? ], BUD ON THEIR HANDS. Budweiser, not blood. My favorite of the themers. 91a. [Kinder, gentler boxing ploy? ], A PINCH IN THE STOMACH. Not punch. 102a. [Kinder, gentler words heard inside a B-52? ], BONBONS AWAY. Not bombs. 112a. [Kinder, gentler sport for George H. W. Bush? ], SHOOING QUAIL. Not shooting. Interesting punny theme, not at all a stale approach here. 1a. [Rodeo bull], BRAHMA. Not the easiest 1-Across, is it? 22a. [Like pocket dicts. ], ABR. Abridged. I was looking for a Spanish-English dictionary for my son. You wouldn’t believe how many “compact” dictionaries are 900 pages long. 43a. [Perspicacity], ACUMEN. Both of these words are delicious to me. 72a. [“See how they smile, like pigs in a sty, see how they ___” (line from “I Am the Walrus”)], SNIED. What, what, what? I kept questioning the crosses here, because it seemed so very implausible. I bet people will be Googling 66d. [Smaller, bite-size version] and MENI or MONI, as SNEED and SNOED make as much sense as SNIED/MINI. 77a. [It gets into a pickle], BRINE. A literal, tangible pickle, not an abstract one. 105d. [Tetragrammaton consonants], YHWH. “Yahweh” with the vowels elided. 13d. [“Teacher’s Pet” star], DORIS DAY. I needed lots of crossings for this. 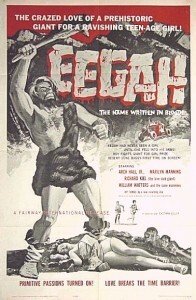 1958 movie that shares its title with a 2004 Disney cartoon and a 2000 horror movie. The fill’s fairly smooth, but there’s not a ton of zip to it (only 10 entries that are longer than 6 letters, for example). 3.75 stars from me. Good day everyone! Hope your Sunday is going great! 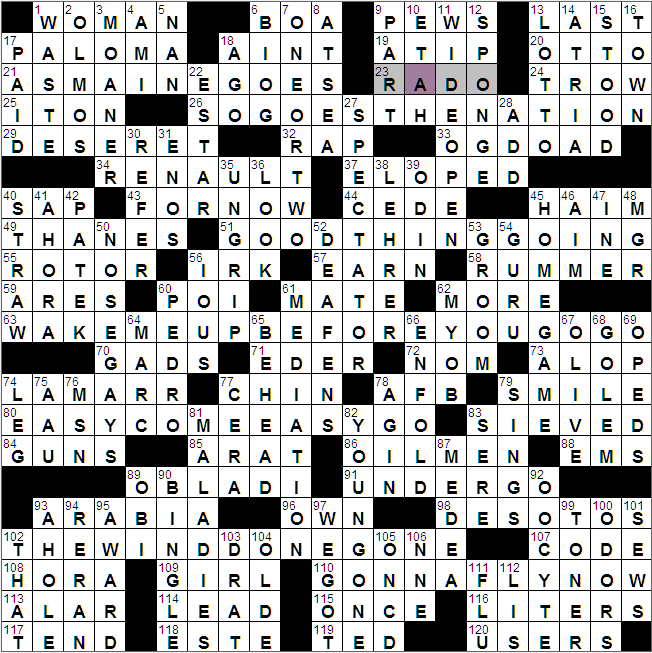 Deepest apologies to you, as I can’t provide a real in-depth review of the puzzle, as I’ve been all around the state of New Jersey covering sporting events back-to-back-to-back (it’s that time of year again). This was a Bob Klahn puzzle that absolutely got the best of me. BTFSPLK (41D: [Joe ______ (“L’il Abner” character under a rain cloud)])????? No way I was getting that in a million years, even if I believed every crossing was right (which I couldn’t be too sure of). Highlights, for me and my successes in the grid, included FOZZIE BEAR (51A: [He often wears a brown porkpie and a red-and-white-polka-dot necktie]) and NATIVE SON (16A: [Hometown favorite]). In my whacked out mind, I’m sure that Mr. Klahn knew it was my birthday today, so he made this puzzle extra, extra devious for me. Great grid, but I wasn’t up to the challenge today…might be too much birthday cake! “Sports will make you smarter” moment of the day: RIVER RATS (3D: [Regular rafters])– The Albany River Rats were a minor league ice hockey team in the American Hockey League that was long an affiliate of the New Jersey Devils of the National Hockey League. The team was based in Albany from 1993 until 2010, when the team then moved to Charlotte. Thanks so much for another week of crosswords, and I’ll see you on Monday! 21a. [With 26-Across, political slogan from c. 1888) AS MAINE GOES | SO GOES THE NATION. This is because Maine includes the easternmost point of the contiguous United States, and the Earth rotates from west to east. Nothing more to see here than basic geography, folks … move along. 51a. [Song from Sondheim’s “Merrily We Roll Along”] GOOD THING GOING. As in, “We have …”, which quickly dissipates to “We had …” and repeat. 63a. [Wham! hit] WAKE ME UP BEFORE YOU GO-GO. No comment. 80a. [Spendthrift’s motto] EASY COME, EASY GO. 102a. [2002 “remake” of a 1936 novel] THE WIND DONE GONE. Not sure if you can call a novel a “remake”, even in “quotation marks”. 110a. [“Rocky” theme] GONNA FLY NOW. Parsed of course as “going to” et cetera. So, therefore and so on, the theme is conjugations and forms of the infinitive “to go”. Trinidad, I’m told, is not happy about this. Seems rather a flimsy theme to my mind. But you know what irked me more than that? 82d [Kid] YOUNG ONE—that’s YOUNGONE—crossing the GONE of the theme answer at 102-across. All right, perhaps—as you might protest—that I’m being overly critical, as that’s only a visual overlap. Fair enough. So you know what irked me more even than that? NINETY-ONE ACROSS: 91a [Experience] UNDERGO. Oh, come on. It’s an across answer, just like the themers. Admittedly, it’s a compound word, but it ends in GO, in the same sense as the theme. No, no, no. Just, no. Bad experience. I guess it proves that HH has feet of clay, like a GOLEM (68d [Automaton]. Since it’s a bugbear of mine when “odor” is overwhelmingly clued in a pejorative sense, I’m going to try to highlight nonjudgmental occurrences. 100d [Bloodhound’s guides] ODORS. 37a [Became running mates?] Great clue for ELOPED. See also 61a [Partner] MATE >bzzzt!< and 53d [Prepare] GROOM. 14d [Places in the heart] ATRIA. Never seen the film, but it’s supposed to be very good. 33a [Eightsome] OGDOAD. Whoa! Wasn’t expecting that! Here are three links. 109a [1-Across, earlier] GIRL, which reminds me that I haven’t yet read Gillian Flynn’s Gone Girl, and the damn Fincher film is going to come out early next month. 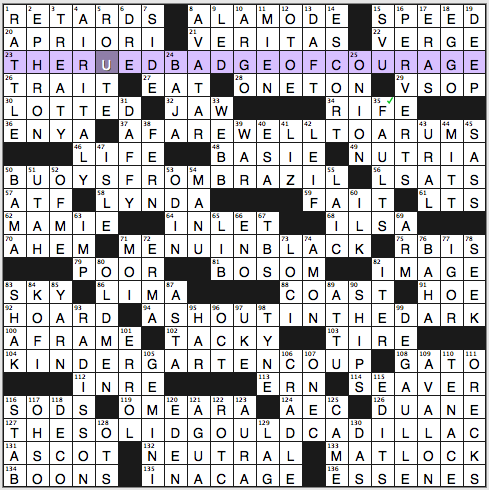 Oh, one-across is WOMAN, clued in reference to the 19th Amendment. Suffrage, you know. Oh hey! You know what else I didn’t care for? The crossing of 10d and 23a. 10d [Greenland outpost] ETAH; you know what I have to say to that? Eegah! The crossing answer? Glad you asked. It’s 23a [James who co-wrote “Hair!”] RADO. Eegah! 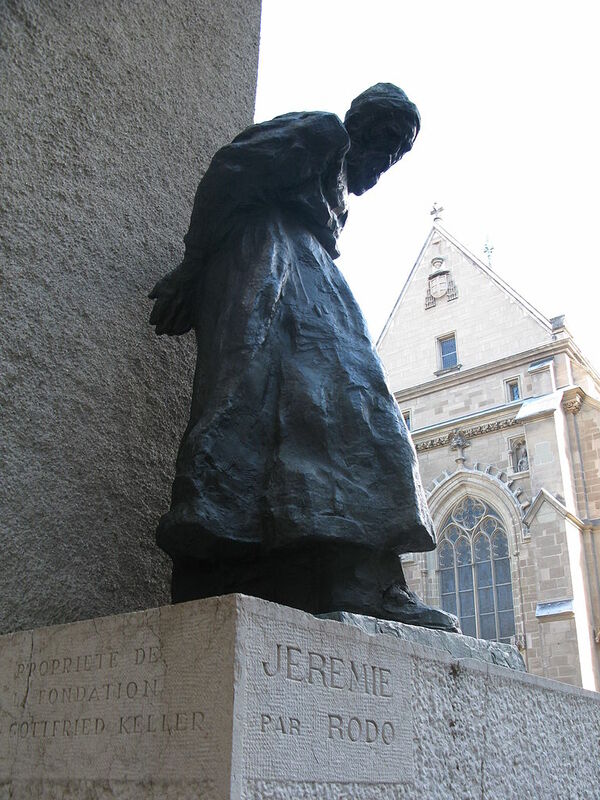 Seriously, I would have been much more pleased if the two were EtOH (ethyl alcohol, which everyone should know about) and the sculptor Auguste de Niederhäusern, aka RODO, who may be rather obscure, but no more obscure than James RADO (plus ETAH, have I mentioned ETAH?). This entry was posted in Daily Puzzles and tagged Bob Klahn, Henry Hook, Matt Skoczen, Merl Reagle, Patrick Blindauer, Tony Orbach, Trip Payne. Bookmark the permalink. “…a little on the tough side…” i had just the opposite experience. had covered up the title, but the theme leapt out at me almost right away w/ CAINE PILLAR — the concept of which put a smile on my face that stayed there throughout the solve. i do love a pure wordplay puzzle like this — and tony and patrick nailed it (imoo…). *lotta* laughs — which made for a most enjoyable experience. also noted the EULOGY/AT PEACE connection and thought GONER [Person whose number is up] mighta been part of the picture as well. Our submitted KIEL clue was about Richard, but I guess Will & Co. thought the puzzle needed more geography. There is already a bunch of pop culture because of the theme. In any case … RIP, Jaws. re KIEL — The Kiel Canal is worthy of note! It allows ships to pass from the North Sea to the Baltic Sea to link German ports without using the much longer northern route around the Jutland Peninsula (Denmark). The first part was completed in 1784, the second part between 1887-1895, and the whole was widened 1907-1914 to allow passage of dreadnaught-sized battleships. The fixed bridges, however, allow only 42 meters clearance, so that very few modern cruise ships can enter. NYT: I like! I usually struggle with puns because of accent issues, but once I grokked the theme, it really helped and it cracked me up on a number of occasions. Genius. As a general rule, I am not a fan of celebrity or spoonerism themes. Combining them would normally be my puzzly kryptonite. But this one was so well-crafted and playful, that it was just joy to solve. The crunchy spots were especially fun to work out. 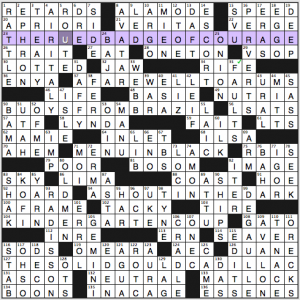 And yet, with both of those words in the title, you decided to do the puzzle anyway. And that is the puzzle masochist in me. 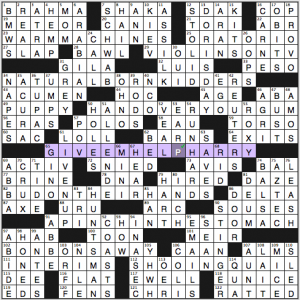 The NYT puzzle is less tough than eye-rolling. Lots of the short fill was horrific and the theme is so wretched as to make the argument for alternating themeless Sundays. Blech. NYT took me somewhat longer than usual for a Sunday, mainly because I originally had WASHPAD for WASHRAG, and it took some time to find that and fix it. Otherwise, a nice puzzle. 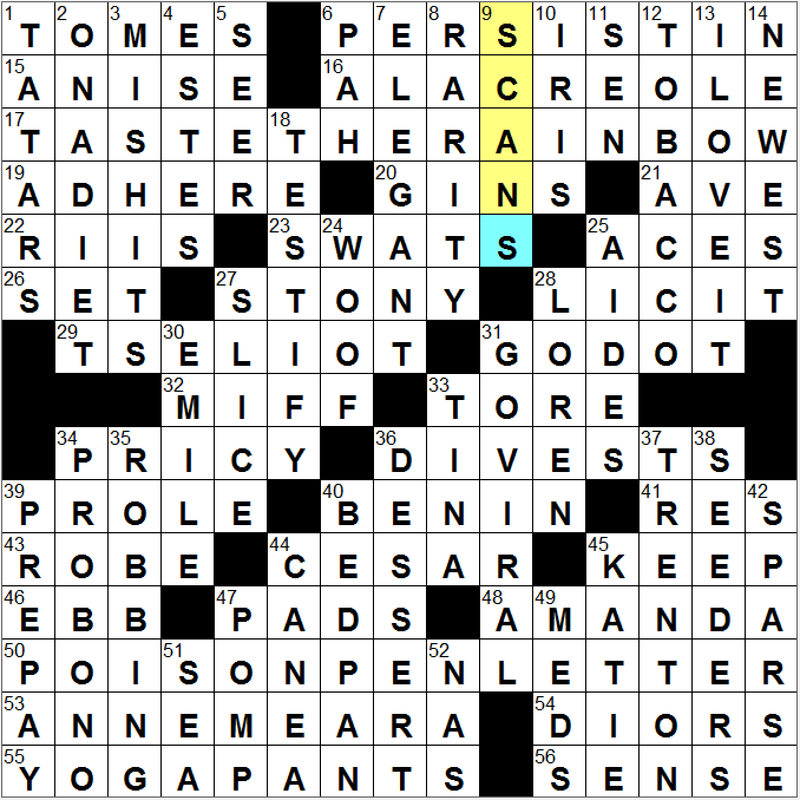 My Post Puzzler experience was just about the opposite from Sam’s: I caught on to the lower half with POISON PEN LETTER, but had a hard time in the NW. For Shanks I wanted Withers or something else anatomical, didn’t know it could be MISFITS, & hadn’t heard of TASTE THE RAINBOW. TATARS in the Crimea didn’t occur to me either! Interesting new DNA revelation: many old graves thought to be those of male warriors have turned out to be of women warriors — complete with weapons, helmets, horses, etc. The ancient Greek depictions on urns weren’t mythical, but accurate records of marauding tribes from the steppes! This is from Adrienne Mayor’s book “The Amazons: Lives and Legends of Warrior Women Across the Ancient World.’ She refers to the tribes collectively as Scythians. SHANKS is a sports term, as in a golf shot or football punt. The answer is actually MISHITS (hehe, turdy word alert). I’ve read that evidence in the last month shows that some Viking warriors were actually women — shieldmaidens lived! — and Marvel is coming out with a new comics incarnation of Thor as a woman. Let’s hope that between battles she has time to make some crossword puzzles too. Was “It came down in 2001” an appropriate clue right after this week’s anniversary? I’m probably missing something blindingly obvious, but how does “BOTHER” rhyme with “FATHER”? Is it an east coast thing? They rhyme in my neck of the East Coast. That’s always the rub on themes with a phonetic twist – Pun size does not fit all. There’s often a difference somewhere for which the effect doesn’t quite ring true. I’m curious. Having lived all over the country — where do they not rhyme? The only possibility I can think of is Kansas. The wikipedia entry seems to suggest that the words would rhyme nearly everywhere in the U.S., except, perhaps Boston and NYC. Interesting reference, Amy. I know of course that the sounds are somewhat different in Boston (close to where I now live); and, as I said, that in Kansas, “water” is pretty close to rhyming with “batter”, but those are about the only places I can think of, in the United States. Yes, curious* to know in which parts (or eras) of New York City those don’t rhyme (along with the other examples, Saab–sob, Kahn–con, and lager–logger; I’m also one those speakers who’s “reintroduced the historical l into balm”, albeit subtly). *But not curious enough to obtain the referenced sources. It’s possible to interpret ‘snide’ as a shortened version of act or look snide, which is a stretch, but makes more sense than the completely unknown word ‘snied.’ Then again I don’t claim to have any insight into John Lennon’s thought processes. Yes, we definitely are. There are probably hundreds (maybe thousands) of unknown faults in California alone. Some are found using various detection and observation techniques, while others are only discovered when they start shaking. For instance, the 1994 Northridge quake, the 2010 Haiti and New Zealand quakes, and the 2013 Philippines quake are just a few examples of earthquakes that occurred on previously undetected faults. I don’t think “Burning desire?” works for ARSON. Pyromania, yes; arson, no. Quality of the NYT was uncharacteristically low overall. Sounds like you need to lower your expectations. Sorry, Patrick! You’re one of my favorite constructors—I swear I’m not just saying that. I love your innovation. Still, I felt there was too much obscure fill in this one, where, even after making my best guess, I didn’t feel certain I had the right answer (GIBB/BOOLA/EGON was a particularly difficult section in that regard). I think of cleaning up that sort of thing as more the editor’s task than the constructor’s, but if I’d known you’d read my comment, I’d have been more tactful in how I phrased it. Would you at least agree that arson (as opposed to pyromania) is an act rather than a desire? We try our best. Also, one man’s obscurity is another’s gimme. I see what you mean on ARSON, but the question mark gives it some leeway, I think. Will used it in before in 2001, fwiw. Aww, I’m sorry again for coming off so harshly. Please forgive me. Your point about one man’s obscurity being another’s gimme is why I think of this area as being largely the editor’s job. Naturally the constructor himself probably knows whatever facts he uses, which must make it harder to judge how it will hit the average reader. I think of cleaning up that sort of thing as more the editor’s task than the constructor’s, but if I’d known you’d read my comment, I’d have been more tactful in how I phrased it. Most constructors leave reading blog comments to their press agents, who only pass along the good stuff. Patrick’s different that way. But nothing you write here will ever be read by an editor — that’s for sure. Btw, re ARSON: it’s not an accidental act, so I think you can say the arsonist has the desire as well as the means to do some burning. “Nothing you write here will ever be read by an editor — that’s for sure.” Why do you say that? I’m pretty sure Will S. and other editors have read some comments as well as checking out the puzzle reviews. I guess my remark about press agents wasn’t enough to signal the intended irony. In other words, Of course what you say here will be read by the editor! Will has stated that he does read the daily blogs, so if you say something about a puzzle, chances are he’s going to see it (though a few days after the fact, maybe not). What struck me about the exchange above was that CY made a comment assuming the constructor would never read it. Then seeing Patrick’s response, he apologized for being tactless but said the comment was really aimed at the editor anyway. Do constructors deserve tact but not editors? I think it’s remarkable that people say things on blogs that they wouldn’t say to someone in person. 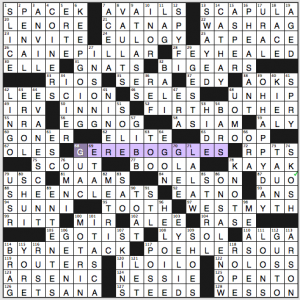 The crossword community is a small, tight-knit group and there are only a few places to read about puzzles. This being a public forum, there’s a good chance that whatever is said here will be read by the constructor and/or editor. If you’re writing something that you’d feel the need to apologize for, maybe you should think about that before posting the comment. Well, “uncharacteristically” mitigated the criticism for the editor, though not for the constructor. Also, I’d expect an author to take more offense than an editor to my original, unelaborated “low quality” comment. 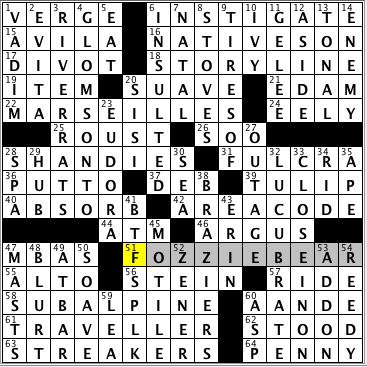 Finally, I hadn’t expected Patrick or Will Shortz to be reading the comments on the puzzle a day later, but clearly I was mistaken on that score. I take your point. re ARSON: it’s not an accidental act, so I think you can say the arsonist has the desire as well as the means to do some burning. Hi, CY. I get your point too. By the way, I didn’t think there was anything egregious about your original comment to require an apology. Compared to some of what Pat has gotten the past week or two, it was tame. “Burning with desire?”: ! Hey, you may see that in a puzzle some day. Yeah, no need to apologize on my account. I can take it! Interesting little discussion here. For my part, I don’t construct for editors or solvers or bloggers or commenters; I construct for myself, and I make the kind of puzzles I would like to solve. Of course nobody enjoys having their work “hated” (or worse), and the personal attacks say more about the hater than the hatee, but I try not to let it bother me. My work was good enough for Will and will appear in books for years to come; most blog comments aren’t even thought about the next day.